 To take up and complete admissions in schools for the academic year 2018-19 from 23rd April to 30th April 2018.  Children completing 5 years of age from AWCs or others to be admitted in Class I.  Children of the special focused groups i.e migrated, slum areas, deprived & disadvantaged groups.  Children residing in the vicinity of Model Primary Schools.  Ensuring that students, who have completed Class VII/VIII are to be admitted in Class VIII/IX in High Schools from 23rd April to 30th April to reduce secondary level drop out.  Ensuring that all the V Class / IX Class students who are targeted for Gnana Dhaara Programme to attend in the allotted centres.  Creating awareness on Gnana Dhaara Summer Residential programme among all SMCs, students, teachers and parents.  Creating awareness on incentives / schemes provided by the Government to the school aged children.  To make aware the parents of students who are studying in private schools about the benefits being provided by the Government.  Plan and lead on the “ManaVooru-BanaBadi" campaign.  Coordinate with PO, SSA for developing and supplying of required publicity material, admit cards, registers, etc.  Delineate the roles and responsibilities of Sectoral officers and CRPs of SSA in working with the field teams to mobilize parents and ensure high enrolment.  Coordinate with MEOs and other field officers and ensure that the entire programme is conducted as per the schedule.  Ensuring all targeted students for Gnana Dhaara programme to be admitted in to allotted centres in their jurisdiction.  Submit a compliance report to the CSE, A.P Ibrahimpatnam, Amaravati.  The Mandal level team should plan and lead on the Mandal and school level campaign.  They should ensure that all habitations in the Mandal are covered in the campaign through participation of the local public representatives.  MPDO, MEO should take up joint action along with the concerned CDPO, Supervisors of Anganwadi Centers to ensure that all children completing 5 years of age in the AWCs and other centres are admitted to nearby MPP/Government School.  The CDPO, Supervisor should provide the data of all children completing 5 years in AWCs to the Headmaster/Teacher of the nearby Primary Schools for taking up the admission process.  The MEO should coordinate with Head Masters and School Management Committees in the Mandal to ensure the admission of school aged children, drop out children and out of school children is done in the nearby Government Schools in the Mandal.  An amount of Rs. 2500/- to 5000/- may be utilised (commensurate with the enrolment to be made in the School) from School Management Committee funds to meet the expenditure towards activities relating to the “Mana Voordu Mana Badi” Campaign for admissions during 2018-19.  The details of the admissions made in different schools and in different classes in various schools in the mandal should be entered on the CSE portal using the MEO login provided.  Details of 5 years completed children should be obtained from the local AWCs and other centres. Similarly details of the students completing 5th class in the Primary Schools and in the catchment area should be obtained.  A meeting should be held with the AWWs and the parents of the children completing 5 years of age. They should be made aware of the benefits of joining the children in the Govt. Schools. They must be assured that good quality education will be provided to their wards.  The Headmasters should be available from 9.00 am. to 6.00 p.m. along with one teacher for enrolling the students and reporting daily to higher authorities and uploading the details. For this purpose, the HM and one teacher will be paid @ Rs.250/-per day per Teacher per school and an amount of Rs.400/-per day for Headmaster per school should be paid. The expenditure should be incurred from SSA Funds at the District Level or from School Grants, where available. The details of admissions made should be entered in the Admissions Register.  An admission card is to be issued to all the students getting admitted to the next class clearly indicating the class in which she/he shall be admitted in the next academic year 2018-19.  HM should submit a report to the MEO on the admissions made in his/her respective school.  All students successfully completing V Class in a Primary School should be admitted to the Upper Primary or High School by required coordination between the UP/High School HM and the Primary School HM/Teacher.  The teacher should identify the catchment area around the school vicinity and ensure that maximum number of children is enrolled in the School.  While making efforts for such enrolment, the HM/Teacher should enlist the support of School Management Committee Members, Local leaders, teachers and Head Masters of schools in the catchment area, NGOs, if any, working in the area, etc.  After a thorough survey in the locality children studying in Government schools, children studying in Private schools, Drop out/Out of School children should be identified and all efforts made to admit them to the next class for the academic year 2018 –19.  The Chairman and Convener should arrange for door to door campaign in the early hours of the day / evening hours with all stake holders at school level. Banners, Placards should be used for the door to door campaign highlighting the benefits provided by the Government to the school age children.  The Brochure/ Pamphlets developed by SSA should be distributed to every parent.  The Head Master should display the details of the children to be enrolled as entered in the register. He/She also should discuss with all stake holders the plan and procedure to admit the children in Government School.  Post card campaign: Letters shall be drafted to the parents whose children are studying at private schools by the students by conveying the message about the effective academic activities of the school and inviting them to admit their children in the school. 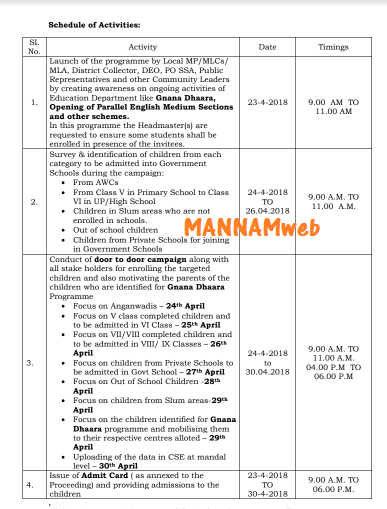  All the teachers are requested to participate in the campaign without deviating examination schedule on 23.04.2018 for better enrolment in their respective school. NOTE: 1) For activity proposed during launch programme, all arrangements should be made to issue Admit Cards to the students identified & participating. Therefore, all the Regional Joint Directors of School Education, all the District Educational Officers and Project Officers, SSA in the State are requested to follow the above instructions scrupulously and submit consolidated report in the prescribed proforma and also submit the anticipated enrolment in English Medium parallel section in Class I of the selected schools.